Heard that bloggo-journo Seri Menanti recently shopped for ‘black leather shoes with laces’. That could only mean for a few possible purposes. Since there is no university or university-college having its convocation, getting an honourary academic award could safely be ruled out. Even though he is familiar with the defense industry and military, it is also unlikely he would receive a commission for the army reserve corp in the near future. Rusdi Mustapha is a well traveled man, a seasoned journo and an interesting creature of cybersphere. He was one time a war correspondent, covering the Bosnian-Serbian conflict for The Sun. He also had a regular column in The Business Times and later The Malay Mail. An eclectic man, he saw the world from different views since the 60s. He is not known to be stingy with stories from his wealth of experience. The Minangkabau man spent considerable time in Manitoba before coming back home in the early 80s. Last year, he published his first book ‘The Malaysian Grafitti’ based on previous his articles which appeared in The Business Times. The collection of friends that turned up for the launching of the book is a demonstration of different walks of life whom Rusdi touched hearts with. KUALA LUMPUR: FORMER Business Times writer Rusdi Mustapha has released a book compiling his columns which appeared in the daily in the early 2000s. According to Rusdi, Malaysian Graffiti was written after being convinced by his friends during a “teh tarik” session. “One friend even came up with a mock hardcover of my “would be” book during our next meeting. I thought why not, and the result is this book,” said Rusdi, who runs a blog called Seri Menanti, after the name of his hometown in Negri Sembilan. 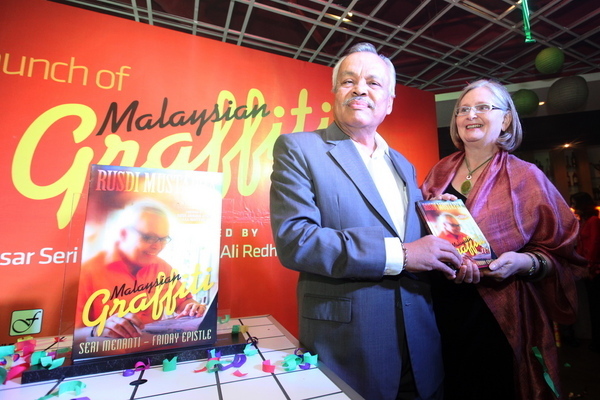 The book title was appropriate, said Rusdi, as it “has many types of writings, as colourful as graffiti”. 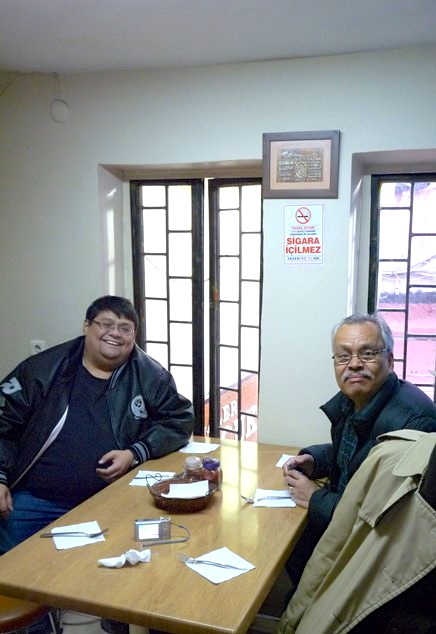 Rusdi has decades of experience as a journalist, working for the Business Times, often writing his own columns. Rusdi said it took several months to compile his articles and come up with the book, which is distributed by Mole Publishing, owned by fellow blogger and journalist Datuk Ahirudin Attan. The book was launched by the Tunku Besar Seri Menanti, Tunku Ali Redhauddin Tunku Muhriz, at a ceremony in Bangsar Shopping Centre here. A small group, comprising Rusdi’s family and friends, gathered to witness the launching of the book, priced at RM59.90 at local book stores. In his speech, Tunku Ali said Rusdi’s style of writing differed in every piece. “One cannot expect to agree with everything he has written — it is provocative at times and the points are debatable,” said Tunku Ali. He has by far coloured the Malaysian journalism with his own unique style, observation, opinion and arguments. We at BigDogDotCom would like to wish Rusdi all the best for near future endeavour. It is expected to be one of his defining moments, for his next book. It is utter shameful that Opposition leaders continue to blatantly lie and treat the Malaysian public like idiots, especially the fake “RM 207 billion blood money obtained from Japan for the ‘Burmese Death Railway’ as a compensation” is so fresh in our minds. Another lie is brewing in the Opposition sinister kitchen. PAS veep: Uncollected MyKad, MyKid sent to Sabah? 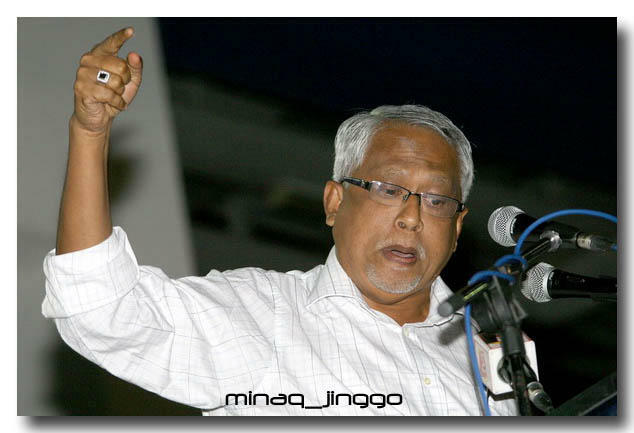 PAS vice-president Mahfuz Omar has asked the National Registration Department (NRD) and the Home Ministry to explain an apparent directive to send uncollected MyKads and MyKids to Sabah. “I am concerned that these identity cards, which should be destroyed, are being given to foreigners to allow them to vote,” the Pokok Sena MP told at a press conference today. Mahfuz (right) claimed that the directive was issued to all state NRD directors and districts in a letter dated Dec 14, 2012, stating that any MyKad and MyKid that was not collected within 18 months should be sent to Keningau, Sabah. Reading out the contents of the letter, Mahfuz said the documents are to be sent to Keningau to be updated, and then returned to the NRD headquarters in Putrajaya. 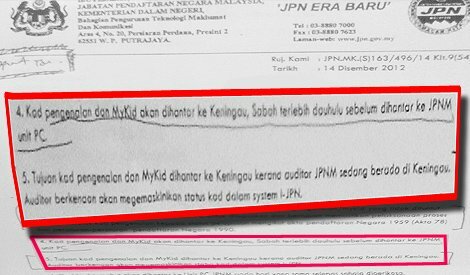 “I want to know how many of the MyKad and MyKid have not been claimed to date. The NRD has to (provide details of the documents) which have been collected,” he said. However, Mahfuz could not ascertain the authencity of the letter, which was posted to him by unknown individual. He pointed out that the address in Keningau which is stated in the letter is suspicious. “The (identity) cards should be sent to the address below: Taman Andika 8, Lot 17, 89000, Keningau, Sabah. Is this the address of the NRD office at Keningau? “I demand explanations. The government should announce it because this thing is very suspicious,” he repeated. The Pokok Sena MP reiterated Pakatan Rakyat’s demand for a royal commission of inquiry (RCI) to address the issue of citizenship or issance of MyKad to immigrants nationwide. “I had exposed it in April 2012, but people thought it was not serious. But what has been admitted in the Sabah RCI is what I have exposed. Not only did it happen in Sabah, but also in the peninsula. “The authenticity of the electoral roll of the peninsula is also doubtful. That’s why we want a RCI not only in Sabah, but for the whole nation. If Mahfuz is demanding that the Home Ministry respond to these preposterous allegations based on this letter, then for the sake of majority of fair-minded-level-headed Malaysians he should commit himself for a psychological evaluation. 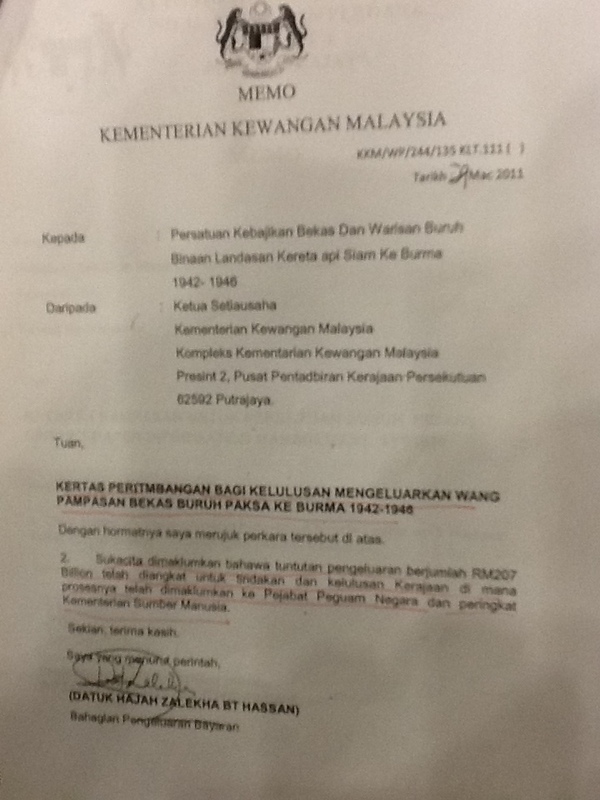 This is because like the “Memorandum from Treasury on the RM 207 billion”, this letter is fake. Sources within confirmed that the letter is fake and doesn’t exist. Federal Government agencies such as National Registration Department have no auditors. They have accounting officers, to manage all the finances. The audit is provided by the Auditor General’s Office. It is really shameful for a Member of His Majesty’s Parliament to do baseless allegations. The very least for him is to check on the authenticity of the signatory before making any political demands. Probably Mahfuz is unable to differentiate between a genuine letter issued by a bona fide senior officer of a Federal Government agency and a fake one. Then again, highly likely that the PAS Vice President is easily fooled with a letter written by an incurable drug addict high on sniffing glue who is also an illegal alien and only able to speak conversational pigeon Malay. Political stunts must have limits. The Opposition leaders’ persistent lies one after another the past five years have reached the stage of insulting the Malaysian public’s intelligence. Starting with ‘Datin Sri Rosmah’s involvement in Altantuyaa Shaaribuu’s murder’, ‘Refuge in Turkish Embassy: Anwar’s life threatened’, “Submarines cannot dive’, ‘RM 24 million ring’, ‘PM Najib’s request to ATM service Chiefs for coup d’etat‘, ‘Omega watch in Wan Azizah’s safe keep’ and the list is endless. Malaysians are tired with all these political stunts. The nation must be protected from over-politicking due to unsubstantiated claims and blatant lies. More than that, Malaysians must have protection against the infringement of their rights against stupid politicians with really stupid political stunts. It is necessary if the nation is moving forward into developed nation’s status. Malaysia cannot afford to have stupid Opposition. 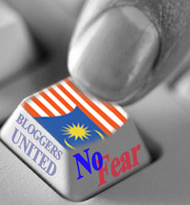 ‘Freedom of Press’ bit of democracy Malaysian style is under attack. International NGO for journalists Reporters Without Borders (RSF) ranked Malaysia’s freedom of press sliding down to a record low. The state of press freedom in Malaysia has hit a historic low, with the country being ranked No. 145 in the latest World Press Freedom Index – the worst since the annual index was begun in 2002. Reporters sans Frontières (RSF) – or Reporters Without Borders – attributed the poor standing to issues linked to the police crackdown on the Bersih 3.0 protest last April, as well as repeated censorship and the undermining of basic freedoms, in particular the right to information. In 2010, Malaysia had stood at No. 141, but then clawed its way up to No. 122 in 2011-2012. The authors listed Bangladesh, Libya, Kyrgyzstan, Thailand, Indonesia and Brunei above Malaysia in the current index of 179 countries. Singapore was ranked No. 149, while Burma went up 18 spots to No. 151 after the “dramatic changes” of last year. The quick blame on this phenomenon would be against the Federal Government. However, Prime Minister Dato’ Seri Mohd. Najib Tun Razak’s leadership provided a lot of leeway for ‘Freedom of Press’, as long as it does not contravene any of the laws. He abolished the Printing and Press Act, which amongst other things require newspapers to renew their annual license with Ministry of Home Affairs. And on top of that, more Ministers and Heads of Department are engaging media, even on sensitive matters such as defense and national security. Media are even brought to experience highly sensitive and strategic weapon system such as the RMN submarines. Prime Minister Najib also plan to abolish Sedition Act. The fact is that, it is the Oppositions who are practicing restraints against ‘Freedom of Press’. Their leaders like Opposition Leader Anwar Ibrahim and DAP Secretary General restrained accredited journalists from certain media to attend their media conferences, especially when they are unable to provide reasonable answers to questions posed. They are also rude to journalists, especially when they have no reasonable answers to offer. On many issues even non controversial ones, they issue gag order to their own people from making statements. For people who once criticized the Official Secrets Act (OSA), Lim threatened to use the law against civil servants of the state where he rules supreme. On top of that, they habitually take journalists and the media they represent to court. Getting a threat to be sued is already a SOP for Opposition leaders. Their distrust of mainstream media is also apparent. When DAP Secretary General and Penang Chief Minister Lim Guan Eng was offered to dive with RMN Perdana Class submarine KD Tun Razak 60 nautical miles off the coast of Langkawi during LIMA 2011, he wanted to bring along Penang-based local Chinese media even though he was told that Tv3 and Bernama already had their reporters on board the submarine. It is simple to conclude that the Opposition played a lot of role in the digress of Freedom of Press Index. And that is before they have been given the mandate. The second son of HRH Yam Tuan Besar Negeri Sembilan Tunku Zain Al-Abidin Tuanku Muhriz admitted that DAP courted him into their politics and offered him to contest as a candidate in Negeri Sembilan. Negeri Sembilan DAP ADUN and immediate former DAPSY Leader Anthony Loke met him in private for the matter. Tunku Zain Al-’Abidin ibni Tuanku Muhriz (picture) said there was nothing wrong with members of royalty taking part in politics, although he had not found a political party he wanted to be a member of. Last Saturday, the DAP’s former vice-president Tunku Abdul Aziz Tunku Ibrahim claimed that the party’s national organising secretary Anthony Loke had asked him to persuade Tunku Abidin to contest in a state seat. Loke, who is also the party’s Negri Sembilan chief, had on Sunday reportedly criticised Tunku Abdul Aziz over his allegations. “I deeply regret his actions. That matter was stated in an informal and closed (-door) meeting, it should be personal in nature. So why the need to hebah-hebahkan (spread it)? “He should respect the individual’s privacy because the one that was linked is not an ordinary person, but (bangsawan) aristocrat,” he was quoted as saying by Sinar Harian Online. Tunku Abidin confirmed today that he had an “informal conversation” with the DAP some months ago, before saying that he was invited to talk with other political parties too. The Ruler’s son, more popularly known as Tunku Abidin Muhriz, said that no political parties had attracted him as they did not articulate the vision of the country’s founder with enough consistency. “In my view, no political party today articulates the vision of our Ayahanda Kemerdekaan (Father of Independence) with sufficient conviction and consistency for me to consider joining them,” he wrote in a six-paragraph statement. In response to claims that “it is improper for a child of a Ruler to participate in party politics”, he listed five members of the royalty who had previously held positions as members of Parliament, state assemblymen and ministers. Tunku Abidin said he has been active in the country’s civil society space even before his father was elected to be the eleventh Yang di-Pertuan Besar of Negri Sembilan. He said he would want to continue contributing to the country through the Institute for Democracy and Economic Affairs (IDEAS) think-tank which was founded by him and other foundations. Former DAP Vice Chairman Tunku Aziz also said that DAP was ready to make him a ‘Cabinet Minister’ if and when the party wins the general elections, on its own and co-operation with present Opposition parties. SEREMBAN – Bekas Naib Pengerusi DAP, Tunku Abdul Aziz Tunku Ibrahim mendakwa Pengerusi DAP negeri, Loke Siew Fook pernah meminta beliau memujuk anakanda Yang Dipertuan Besar Negeri Sembilan, Tuanku Muhriz Tuanku Munawir untuk menjadi calon parti itu dan bertanding di kerusi Dewan Undangan Negeri (Dun) pada Pilihan Raya Umum ke-13 (PRU13). Tunku Abdul Aziz berkata, Loke meminta beliau mengadakan satu majlis dan menjemput Tunku Zain Al-‘Abidin ke majlis itu untuk menyatakan hasrat tersebut kepada baginda. “Kerana DAP telah melihat Tunku ini seorang yang amat pintar, petah bercakap, jadi dia nak sasarlah Tunku dan suruh saya sebagai ‘Tunku yang tua’ barangkali boleh saya pujuk ‘Tunku yang muda’ ini. “Kononnya untuk bagi Tunku jadi Menteri Besar Negeri Sembilan. Tidakkah ini satu benda yang bodoh, tak masuk akal. Anak jadi Menteri Besar, ayah jadi Yang Dipertuan Besar,” katanya dalam satu ceramah di sini malam ini. Tunku Abdul Aziz berkata beliau bagaimanapun telah menyampaikan hasrat DAP itu kepada Tunku Zain Al-‘Abidin namun ditolak baginda. Al-‘Abidin untuk bertanding mewakili DAP, dan kali ini di kerusi Parlimen serta berjanji akan menawarkan jawatan menteri Kabinet kepada baginda jika pembangkang menguasai Putrajaya. Bagaimanapun, Tunku Abdul Aziz berkata, beliau tidak menyampaikan hasrat Loke itu kepada Tunku Zain Al-Abidin kerana berpendapat ia sesuatu yang tidak masuk akal. Katanya, perkara ini jelas menunjukkan DAP adalah parti yang sanggup melakukan apa sahaja bagi menguasai Putrajaya sehingga ke tahap ‘memancing’ anakanda pemerintah utama Negeri Sembilan untuk bertanding dalam pilihan raya mewakili parti itu. Dalam pada itu, Tunku Abdul Aziz menyifatkan tindakan Setiausaha Agung DAP, Lim Guan Eng yang mahu kalimah ALLAH digunakan dalam Bible sebagai tidak sensitif dan Ketua Menteri Pulau Pinang itu adalah ‘batu api’. Tunku Abidin has the right to take up the offer and jumped into politics or stay outside and be what he has been these past three years in an NGO formed to make comments on politics of this nation. It is not whether or not Tunku Abidin accepted DAP’s offer and then worked on it to formalize it and contest in an election when the opportunity presents itself. It is about how did it come about that the DAP man stepped up to him and make the offer, even though in private. Tunku Abidin must have been in the past been showing the qualities and most importantly, the tendencies of anti-Malay for DAP to court him. It is highly unthinkable that the party which have been demonstrating its anti-Malay, anti-Islam and even anti-Monarchy tendencies would court children of other Royal Households especially princes or princesses of a reigning HRH Malay Ruler. It does not matter if he could list five or more different princes of HRH Malay Rulers who have been active involved in politics and elected as ‘Yang Berhormat Mulia’s through time. They have been with UMNO because in the past, it was UMNO (or UMNO spin-off) which championed the rights and powers of HRH Malay Rulers when Whitehall declared Malayan Union. 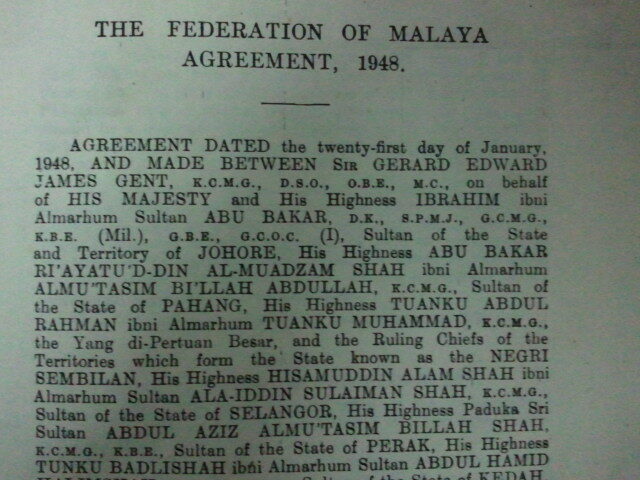 It was also UMNO which was in arms with HRH Malay Rulers in the consultation and negotiations for almost two years that lead to the Treaty of Persekutuan Tanah Melayu signed on 21 January 1948 and came into force eleven days later. An issue of HRH Sultan of Kedah Tunku Abdul Rahman was UMNO’s President for twenty years (1951-1971). His leadership and wisdom a peoples’ prince managed to convince HRH Malay Rulers to give the right to rule in favour of Westminster-styled Constitutional Monarchy democratic system. It is the right time to remind of Tunku Abidin’s scathing remark against UMNO during UMNO Annual General Assembly in December 2011. It was seen as ‘distasteful’ for a son of HRH Malay Rulers to write such a commentary in a very popular English daily considering that UMNO is a party of the masses, by the masses and for the masses and being born with a silver-spoon, he hails from the ‘Ruling Class’ and never did live the lives of the masses. Never the less, Britain educated Tunku Abidin has the right to be ‘liberal minded’ and possess no affliction for UMNO as the champion for the commoners. However as a political commenter, he must appreciate what UMNO had done for the Malays since they came into power under autonomy government in 1955. The socio-economic position of the Malays have been improved by leaps and bounds to where they were to present day. There were hardly any commoner amongst the Malays with tertiary education in the 50s. Today, some of the commoner-class of the Malays are world-class plc CEOs, bankers and financial market practitioners. Commoner Malays are also experienced submariners and even conquered space. It was UMNO’s struggle saw the 54 MARA Junior Science Colleges being built so far since the formation of the New Economic Policy 40 years ago and brought the rural Malays who in the past had no access to good secondary education, into preparatory studies for science and technology. That enabled many these rural commoner Malays to qualify for education in institutions such as Tunku Abidin’s alma mater, King’s College, Imperial College of Science and Technology, Oxford and Cambridge Universities. Let us be clear about the fact that the prince has never did any public analysis to measure the progress of the Malays nor the demands and socio-economic development proposals UMNO delegates brought forth in every Perhimpunan Agung UMNO being realised through the years despite the wealth of knowledge from his London School of Economics education and experience working in Westminster and World Bank in Washington D.C.
His criticism of UMNO and frame of mind via his speeches and writings, has been seen as ‘asset’ for anti-Malay DAPsters and served their agenda. Just like they embraced the Malay-wannabe whose claim of a former UMNO stalwart and close confidante’ of Tunku Abdul Rahman is his biological father, in their attempt to disillusion the more liberal-minded modern Malays. These are facts. Just like former Vice Chairman of DAP and DAPSY Leaders who met up with the ‘Tunku’ who claims that he is inspired by the ‘Tunku’, who did a lot to alleviate the Malays. The ‘Kalimah Allah’ issue is something which is a matter of choice rather than unavoidable. It had been something that should not happened right from the start. Now, before it becomes something ugly, too huge of a fire to manage and regrettable for too many Malaysians, an individual is making the appeal for the whole matter to be avoided. This is an appeal to the Christian community in Malaysia to drop the use of “Allah” in the Alkitab. Before you become defensive and/or offensive please read through my reasons. The first reason is a biblical one. Christians are called upon to live in peace with all men (Rom. 12:18; 1 Tim. 2:2; Titus 3:2). The unabated provocations against the minority Christians in this country call for restraint and calm on our part. We are to repay no one evil for evil. We are not to avenge ourselves. We are to overcome evil with good (Rom. 12:17-21). We have already won the legal battle for the use of ‘Allah’. The law courts have declared that we have the right to use the word. No language is the prerogative of any ethnic group. A language may not be compared to a borrowed car, in which the rights belong to the owner. Rather, a language is public domain. The Scots, the Welsh, and the Irish have as much right to use the English language as the English people. The late Steve Jobs had the right to call his computer the Apple. Malaysians have the right to develop and speak Manglish. It is one thing to hold to religious convictions, it is another to uphold the rule of law. The onus is upon the law-makers and the law-makers-to-be to prove that they are capable of rising above themselves to uphold the rule of law. Otherwise, why should they be made law-makers? The second reason is a linguistic one. In Arabic, ‘Allaah’ is derived from the common noun ‘ilaah’ in a similar way that ‘God’ is derived from ‘god’ in English. In the Malay language, however, ‘Allah’ is adopted from Arabic while the corresponding generic word ‘ilah’ has not been similarly adopted. In the Malaysian context, ‘Allah’ is the personal name of the god of Islam. The generic word for ‘god’ is ‘tuhan’, and not ‘ilah’. The early Christian missionaries to South-East Asia translated ‘God’ as ‘Allah’ only because they wanted to retain the word ‘Tuhan’ for ‘Lord’. I have proposed that we use ‘Tuhan’ for ‘God’ (Hebrew, ‘Elohim’; Greek, ‘Theos’), and ‘Yamtuan’ for ‘Lord’ (Hebrew, ‘YHWH’; Greek, ‘Kurios’). The word ‘Yamtuan’ is of Minangkabau origin and has been absorbed into the Malay language. It carries the meaning of ‘Yang Dipertuan’ or ‘Baginda’, i.e. ‘the highest Lord’ or ‘his Majesty’ in English. ‘Yamtuan’ is a dual-syllable word which would not be confused with ‘Tuhan’ when they are used together. Using ‘Tuan’, meaning ‘Lord’ or ‘Sir’ will cause confusion when used with ‘Tuhan’ as the two words sound similar when spoken. Furthermore, ‘Yamtuan’ rhymes with ‘Tuhan’, which makes for easy amendment of existing Malay hymns. The translation is a breeze, at the same time that it removes the association with the god of Islam in the minds of both Christians and Muslims. The third reason for not using ‘Allah’ is a theological one. Since ‘Allah’ in the Malay language is the personal name of the god of Islam, it is theologically unwise for Christians to use it in reference to the trinitarian God of the Bible. Furthermore, the Old Testament had been translated from Hebrew into Greek, known as the Septuagint, long before Jesus Christ was born of the virgin Mary. Jesus Christ and the apostles placed their imprimatur on the Septuagint by using it, as can be seen from their constant quotation from it in the New Testament. The Septuagint translates ‘Elohim’ as ‘Theos’ (English, ‘God’), and ‘YHWH’ (Yahweh or Jehovah) as ‘Kurios’ (English, ‘LORD’). The New Testament was written in Greek, in which God is referred to as ‘Theos’, just as in the Septuagint, while Jesus Christ is addressed by the title of ‘Kurios’. The Septuagint and the New Testament thus set for us the pattern of translating ‘Elohim’ and ‘YHWH’, as well as the pattern for how Jesus Christ is to be addressed. Quoting the theologian, John Owen, “an apostolic example has the force of a divine institution”. This pattern has been followed in the translation of the Bible into English and various languages, but is not followed in the Alkitab. The suggestion to use ‘Tuhan’ for ‘Elohim’ (‘God’), ‘YAMTUAN’ for ‘YHWH’ (‘LORD’), and ‘Yamtuan’ (‘Lord’) to address Jesus Christ is consonant with apostolic example. It is the constitutional right of non-Muslim Malaysians to use ‘Allah’ since the freedom of religion, speech and association is guaranteed, and the use of any language, including Malay, is not the sole prerogative of any ethnic group. We have won the legal battle for the right to use ‘Allah’, although there have been attempts made to hinder us from using it freely. The recent hoo-hah over the use of ‘Allah’ has revealed that a sizable number of Muslims in the country are distressed over its use by the Christians. Can we not go the extra mile to show forth Christian love by not using ‘Allah’? After all, there are the biblical-theological-linguistic reasons for not using ‘Allah’ which must now be weighed up. It is not for others to force us to drop the use of ‘Allah’. It is for us to choose not to use it out of the conviction of the rightness of not using it. The liberty of conscience is a precious truth. God alone is Lord over the human conscience. We are all looking forward to a better Malaysia, in which there are definite attempts made to abolish discrimination based on colour, class and creed. The cry for “liberty, equality, and fraternity” resonates in every heart. At the base of that ideal is the truth of the liberty of conscience. Brethren, will you give this appeal – to drop the use of ‘Allah’ – your consideration? The past month, the issue came into very ugly light when Chinese Chauvinist DAP Secretary General Lim Guan Eng raised the matter in his Christmas message. He very well understood the extend of the sensivities and in his consciousness, provoked the majority with the matter. 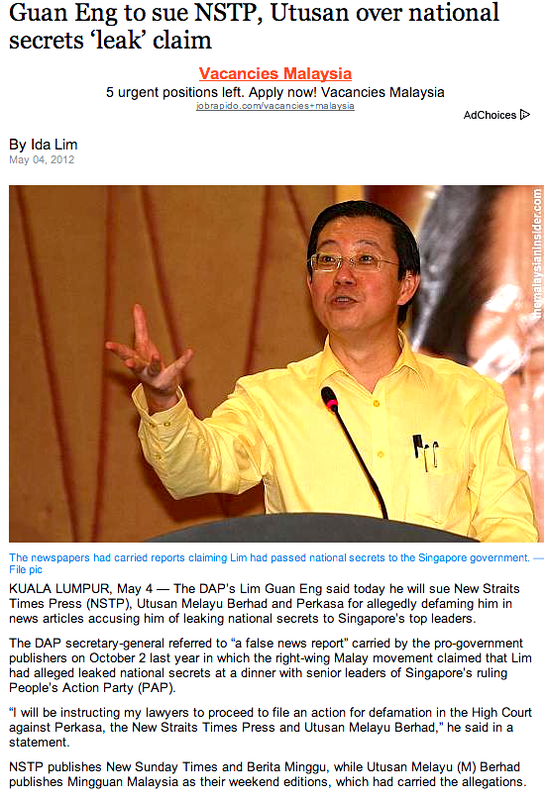 Lim needed to project to DAP’s ‘political market’ that the Chinese Chauvinist party is still relevant. Provoking into racial and religious ultra-sensitivities had always been DAP’s modus operandi, ever since the first general elections they participated in 1969. As radicals, they sowed hatred amongst the minority Chinese against the majority Malays, focused on the urban Chinese majority areas. Today, DAP kept the sensitive issue continued burning in their ‘Politics of Hatred’ strategy to demonise the majority-backed Federal Government, law enforcement agencies and authorities and indirectly attack the sanity of Islam, the definition of the Malays and the authority of HRH Malay Rulers as Heads of Islam. If nothing is done, they would provoke an inch deeper. They would throw in worse insults and provocations. 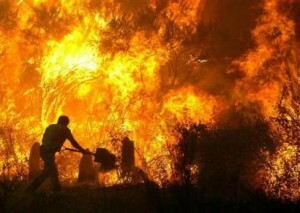 DAP planned for the ‘uncontrollable forest fire’. They thrive in chaos. Now that the Chinese especially amongst the urbanites gave them a strong support (translated in the 12GE), they are confident that the majority-backed Federal Government via its agencies and authorities would not take decisive action against them. On top of that, now that the Federal Government would not allow the Police to do another ‘Operasi Lalang’ (as they did in October 1987) even if the law still permits them to do it, they would not have anything else to stop them from starting the ‘bush fire’. Coincidentally, ‘Operasi Lalang’ was named as such because the Police wanted to prevent ‘bush fires’ by stopping the ‘fire starters’ and arrested all of them using the Internal Security Act. It is wise to avoid forest fires. They say people in glass houses should not throw peebles. Many believe the combination of current technology and information disseminating efficiency, the tendency of manipulation and even deception in an ‘over-heated’ political climate and ultra-senstivity state of mind and emotion, ‘bush fire’ easily would be fanned into ‘forest fire’. This tanah air is a land of plenty. The Non Malays, naturalized as citizens of Persekutuan Tanah Melayu in the year when the nation-hood was formed and ‘Merdeka’ was achieved, even though many of them did not pass the two conditions set under Article 12 of the Persektuan Tanah Melayu Treaty inked on 21 Jan 1948 as replacement to Malayan Union. These 1 million Non Malays are free to go into their own ventures and amass assets and properties, they placed themselves comfortably. They are also free to practice their religion and erect their own places of worship, as long as it doesn’t intervene into the position of Islam as the religion of the Federation of Malaya and prosetilyse the Malays into Christianity or any religion of the Non Muslims. All that are at the good will of the Malays through leadership under Chief Minister Tunku Abdul Rahman and his ability to convince HRH Malay Rulers to accept the ‘Stateless Persons’. All of these should not be breached what were agreed and the spirit all of these agreements were achieved. It should not also be at the expense of all these agreements which settled various socio-politco-economic system that propelled the nation this far. even though the society has evolved into a more sophisticated once. It is much easier to bring down a house made from a pack of cards compared to erecting it. The Opposition is packaging PERKASA and UMNO in the same racial anti-Malay overtone in their ‘Politics of Hatred’ strategy to come into power, especially staying relevant to the Non Malays and the younger and educated but liberal Malays. PETALING JAYA, Jan 25 — Perkasa can get away with racial slurs and religious insults because it is backed by Umno, Opposition Leader Datuk Seri Anwar Ibrahim alleged today. Malay rights group Perkasa and its president Datuk Ibrahim Ali have been playing up racial and religious issues as Election 2013 looms, without any rebuke from the government or the ruling coalition Barisan Nasional (BN). “(Perkasa) is an organisation outsourced by Umno to fend racist and religious bigotry at the behest of Umno,” Anwar (picture)claimed here. During Perkasa’s convention in Penang last weekend, Ibrahim had urged Muslims to unite and burn all Malay-language bibles that contain the word “Allah” and other religious words in Arabic script. “We have not yet found a tough response by the Umno leadership nor the prime minister, nor the home minister,” said Anwar. Anwar said that parties on both sides of the political divide can continue their political battles, but should never resort to defending racial and religious bigotry. On Wednesday, Anwar had called for Muslims nationwide to condemn Perkasa’s threat to burn all Malay-language bibles. The opposition leader, a Muslim, said those who profess Islam and claim to protect “Allah” and the Quran should also defend their faith and morals by preventing the spread of racial insults, which were discouraged by the religion. Yesterday, Perkasa insisted that its president’s words were actually a “wake-up call” to prevent possible violence against distributors of bibles containing the word “Allah” and other religious words in Arabic script. The group’s secretary-general, Syed Hassan Syed Ali, said Perkasa was merely protecting Islam and its position, as enshrined in the Federal Constitution, and this included rejecting those who insult the religion and who try to spread their own faiths to Muslims. Ibrahim’s remarks had immediately sparked furore among Christians and politicians across the political divide and invited calls on the government to cite him for sedition. The “Allah” dispute, which first erupted after the watershed Election 2008, remains a hot-button topic in the run-up to this year’s polls. Debate resurfaced last month after DAP secretary-general Lim Guan Eng, who is also the Penang chief minister, called on Putrajaya in his Christmas message to lift a ban on Malay-language bibles in Borneo Malaysia. Hot on the heels of the DAP leader’s remarks, several state Rulers and Islamic religious authorities reminded non-Muslims of state laws banning use of the word despite conflicting with a 2009 High Court judgment that ruled “Allah” was not exclusive to Islam. It is expected of Opposition Leader and former-abuse-of-power-convict Anwar Ibrahim to manipulate situation. The basis is far from how it is put forth now. The ‘Kalimah Allah’ in Malay bibles and other literature by Chrisitian organizations issue has been seen provocative to the sensitivity of the Malays. It is also seen as an avenue to legalize bit by but attempts to profess the teachings and prosetylise Malays into Christianity. PERKASA President Dato’ Ibrahim Ali was just defending provisions that has been enshrined in the Federation of Malaysia Constitution, Article 11(4). In his Christmas speech, DAP Secretary General Lim Kit Siang reiterated the call that ‘Kalimah Allah’ be allowed in Malay bibles. That stirred a lot of reaction from the Malays. 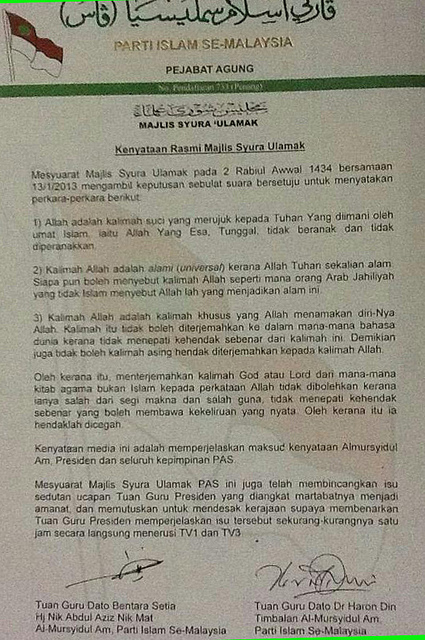 On 13 January 2013, Majlis Syura PAS rejected the notion of ‘Kalimah Allah’ be allowed to be used as depiction of God by Non Muslims. Ibrahim was just expressing in passing his dismay on the issue of provocating the Malays which now traspass via the provisions in the Federal Constitution with regards to Islam, during the PERKASA convention last Saturday in Permatang Pauh. Of course, the context that these Malay bibles with ‘Kalimah Allah’ is meant to profess and proselytization the Malays to Christianity, which is against the law. In August 2011, 100 Muslims were found in a proselytization event in a raid by JAIS at Damansara Utama Methodist Church Petaling Jaya and 12 were brought in for investigation. Islam is the religion of the Federation of Malaysia. It is one of the defining elements for Malay-hood. The Malays are the majority of Malaysians and have not been restrictive for the Non Malays to practice their religion and culture provided that it does not contravene against what is sacred to the Malays. What Ibrahim said in passing during his welcoming speech, was blown out of proportion for a specific agenda to use PERKASA, to sow the ‘Politics of Hatred’. The fact still remain, PERKASA as a Malay NGO is defending what ever has been provided with regards to the interest of the Malays as per the Federation of Malaysia Constitution and nothing more. Neither PERKASA nor its leaders like Ibrahim ask what ever rightfully and earnestly owned by the Non Malays to be returned, for any reasons. UMNO has never asked PERKASA to act on its behalf for any agenda, be it political, social or cultural. UMNO is capable to all of the issues with regards to the interest of the Malays through its own channel, be it in the open via its leaders’ speeches and statements made or behind certain forum, which include the Cabinet and Barisan Nasional avenues. It is clear that Anwar is desperate to manipulate issues like this to stay relevant. However, so many persons including one time his own staunch supporters are convinced that he is no longer relevant. “What ever Anwar is saying now is no longer relevant, especially he has been proven to be a New Con Jewish lackey”, Murshidul Am TIBAI Zahid Md Arip said. Islam has been misconstrued in many ways, too many times and Muslims have been descrated as very aggressive. There was a fear against Muslims in the West. However, Muslims in New York City is setting a very good example of engaging the public, in the name of Prophet Muhammad S.A.W., Rasulullah. Karen Armstrong, a leading British researcher on Islam shares her thoughts on Islam and Muhammad S.A.W., being compassionate and just. In this next Youtube, is the last sermon of Muhammad S.A.W., during the Hajj pilgrimage the year before he was called to be with Allah S.W.T. Muhammad Bin Abdullah was born to the Hashimite clan of the Quraisy tribe in Mecca, Arabian subcontinent this day, in 570AD. He was an exemplary child who grew into an honest business manager and eventually an entrepreneur. He grew in the times where Meccans were idol worshipping barbarians and made money from the pilgrims that have come to the city. Idols erected around the Ka’aba which was build by prophet Ibrahim A.S. In search of his own answers to the greatness of God Al Mighty the Maker of universe, Muhammad started to isolate himself in Hira’ cave on a mount An Nur, 2 miles outside Mecca. At the age of forty, during on of the nights Muhammad was in self isolation Archangel Gabriel appeared and forced him to recite the first Quranic verses of Surah 96 Iqra’. Muhammad S.A.W. became the last prophet that night. Bit by bit, words of Allah S.W.T. in 6,666 verses in 114 surah (books) to mankind were presented through Muhammad S.A.W. in the medium of Al Quran. Muhammad S.A.W. also taught religion of Allah S.W.T. for 23 years via his own words, articulations, examples and actions, also known as hadith and sunnah. Many of the commands of Allah S.W.T. mentioned in the Al Quran were articulated by examples by Muhammad S.A.W. This include prayers. Muhammad S.A.W. was brought to Al Aqsa mosque and to the heavens to meet Allah S.W.T. in an incident known as Isra’s Mikraj on the night 27 Rejab on the twelve year of his prophethood. He flown on the Buraq accompanied by Archangel Gabriel, brought across all seven level of heavens and back, to witness the greatness of Allah S.W.T. and a whiff of the future. Even though Muhammad S.A.W. was an illiterate, he was a great communicator, teacher, administrator, military leader, examplry family man and community leader and was just to all. He also practiced remarkable diplomacy and a renowned as an unsurpassed strategist. In 20 years of Islamic teachings, Muhammad brought the Arabs out from the dark ages to be superb traders, military force and advocates of Islam. Muhammad S.A.W. passed away in Medina at the age of 63 and his teachings, legacy and the spread of Islam was continued a series of caliphs beginning with his most trusted confidante Abu Bakar As-Siddiq. The holy Al Quran and Muhammad’s hadiths and sunnahs brought upon the once barbaric Arabs to be a world superpower in international diplomacy, military might, trade, mathematics, science and technology, administration and arts within the next 250 years. 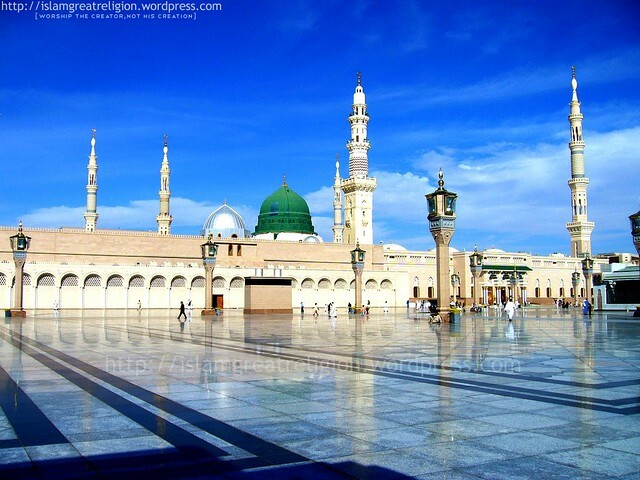 Salawat to Muhammad S.A.W. Rasulullah. Those who are weak or perhaps ignorant about the history on how Persekutuan Tanah Melayu was born should spend more time reading and researching on it instead trying to comment on subjects they have little or limited understanding. There is no need to focus on Dr Mahathir Mohamad’s allegations on the awarding of citizenship in the country prior to Merdeka, at least until the completion of the ongoing royal commission of inquiry (RCI) in Sabah, says Khairy Jamaluddin Abu Bakar. Instead, attention should be given to the ongoing RCI on illegal immigrants in Sabah as it unfolds, for it could reveal more witnesses providing a more rounded description of the issue, the Umno Youth chief said. “We need not answer any comments on the RCI, including comparisons between this RCI and the pre-independence citizenship programme, until the inquiry is complete and the RCI is done with its work,” Khairy said. He said this when asked to comment on former prime minister Dr Mahatir Mohamad’s suggestion that a commission be set up to investigate the granting of pre-Merdeka citizenships to illegal foreign immigrants. This evening, MCA president Dr Chua Soi Lek too joined Khairy in shooting down Mahathir’s call for an RCI to be established on citizenships awarded prior to Merdeka. Chua said the the pre-Merdeka decision was arrived at consensus among Umno, MCA and MIC of the then Alliance Party, and there was no need to revisit it. “No, why should there be a (royal) commission of inquiry when this was a consensus? “So this is a very old issue, we should not revisit, it’s a past, it’s a historical fact, well documented,” Chua told a press conference after the party’s presidential council meeting. Constitutional law expert Abdul Aziz Bari has said Mahathir’s proposal could affect the social contract between races as it presumes the awarding of citizenship to the Chinese and Indians by the first prime minister Tunku Abdul Rahman was illegitimate. As for the call by Perkasa president Ibrahim Ali for Muslims to burn the Bahasa Malaysia version of the Bible that uses the word ‘Allah’ to refer to ‘God’, Khairy urged all parties, regardless of race or religion, to be more sensitive when issuing statements. All Malaysians, he said, possess deep feelings when it comes to the sanctity of their religion. “My advise is that we must be cautious of our statements so that we do not hurt the feelings of any party. “There are some who say Malaysians are too sensitive but all Malaysians, regardless of religion, love their respective beliefs. “Therefore, I urge that we be careful and this (advice) is directed at all quarters,” he said. Khairy, who is also Perbadanan Usahawan Nasional Bhd (PUNB) chairperson, was speaking to reporters after the ‘PUNB Biz Plan Challenge 2012′ prize-giving ceremony in Kuala Lumpur this morning. UMNO Youth Leader Khairy Jamaluddin should understand his role in UMNO, the party which was instrumental to fail the Malayan Union in 1946 and was an integral part of the negotiations that resulted to the Perjanjian Persekutuan Tanah Melayu signed between HRH Malay Rulers and British High Commissioner Sir Edward Gent on 21 Jan 1948. Persekutuan Tanah Melayu was born and the first constitution was put to force. 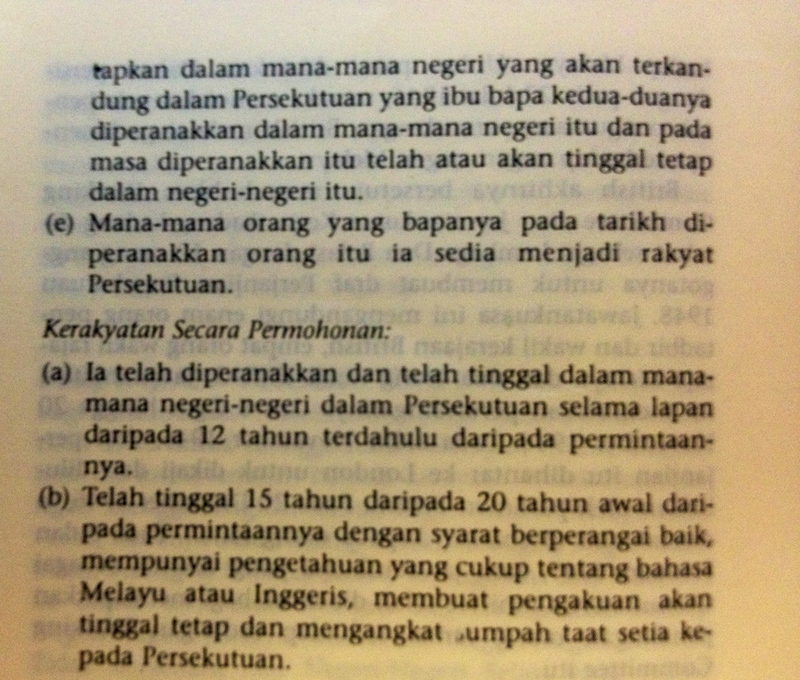 Article 12 of the Perjanjian Persekutuan Tanah Melayu outlined the definition of ‘subjects of HRHs’ and those who are eligible to apply for citizenship of the Federation. Fourth Prime Minister Tun Dr Mahathir Mohamad related that in the past, only the Malays were ‘subjects of HRHs’ and majority of the Non Malays, particularly the Chinese and Indians who were at the time regarded by the British as ‘Statesless Persons’. Never the less, even though Perjanjian Persekutuan Tanah Melayu of 1948 was about the agreement between HRH Malay Rulers, UMNO and Menteri Besars (representing the rakyat) and Britain, and in the 1955 Federal Legislative Assembly election was about 84% of the 1.6 million voters were Malays, Tunku Abdul Rahman and UMNO made concessions against the Chinese where as 11% of the eligible voters, MCA was allocated with 29% of seats contested. 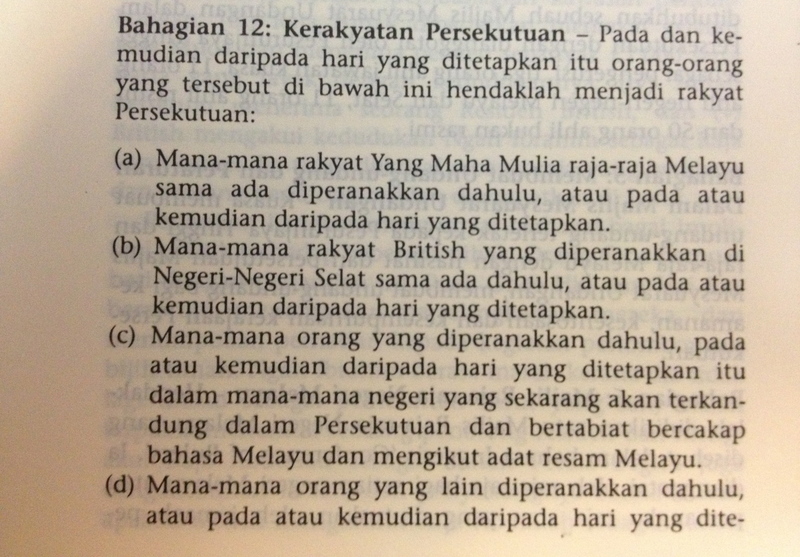 The formation of Persekutuan Tanah Melayu government saw Tunku Abdul Rahman agreeing to issue citizenship for 980,000 Non Malays, especially they were not process according to the ruling that has been stipulated under Perjanjian Persekutuan Tanah Melayu Article 12. It should be seen as a ‘goodwill’ to the Non Malays, especially the Chinese. Khairy has the duty to explain the details of what happened before, during and the outcome of the Perjanjian Persekutuan Tanah Melayu signed 21 Jan 1948 which is the basis of the Federation of Malay Constitution that came into force on 31 August 1957. All of the ‘Special Provisions for HRH Malay Rulers and the Malays’ are reflected in the Federation of Malaya Constitution. It is because the Khairy’s predecessors were integral part of the fight against Malayan Union, Perjanjian Persekutuan Tanah Melayu, 1955 Federal Legislative Assembly election and the ‘social contract’ process and negotiation, which resulted to the 980,000 Non Malays given the citizenship to the Federation and provisions in the Federation of Malaya Constitution which came to force on 31 August 1957. The Rembau MP’s call to ignore what Tun Dr Mahathir asked in Permatang Pauh last Saturday is an attempt ‘to sweep things under the carpet’ rather than take action, carpe diem. This is the best time for him as UMNO Youth Leader to engage and explain to younger Malaysians of the nation’s formation history and how and what the concessions the Malay Rulers and Malays made for the Non Malays. Going forward with a liberal frame of time and tone, pandering to the younger Malaysians’ popularity especially Gen-Y should not at the expense of the history as how it happened. Malaysian history the past two hundred years are about series of treaties and agreements. Agreements in the past are demonstration that Malayans, especially the Malays went through a process of consultation and negotiations before agreeing to any proposals. It is a message for younger Malaysians to emulate if they want to express themselves and change anything, without antagonizing any parties or being overtly aggressive. Malaysian Prime Ministers since 1955 have shown examples that they are open for consultation on any issues, even for the interest of minorities. 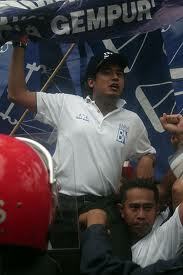 Khairy should use this opportunity as a challenge to expand and deepen his popularity, by engaging the youth and make them the advocate of the Federation of Malaysia formative history in the tone of the compromise and concessions given via series of consultation and negotiations, not intimidation and aggression. A lesson for all. It is still relevant, present day included. Which part of this act is not criminal? Suspended Bank Islam Chief Economist Azrul Azwar “Wawa” Ahmad Tajuddin claims his act of leaking so many highly confidential and sensitive information and scanned documents of the bank via e mails which include Board of Directors (BOD) and Exco papers to third party without consent is not criminal in nature. KUALA LUMPUR, Jan 22 – Azrul Azwar Ahmad Tajuddin has defended himself against his employer Bank Islam Malaysia, saying today the bank’s police report against him is an intimidation tactic and their allegations are a civil matter and not criminal in nature. The bank announced today it has filed two police reports against their suspended chief economist, accusing him of possessing and leaking confidential documents to a third party. “In response to the police report lodged against me, I wish to reiterate that the allegations contained in the police report made by my employer do not constitute any criminal offences. “At most, it is only a civil matter which is now the subject of an internal inquiry between my employer and myself. I cannot see why this matter is now being turned into a police case,” Azrul (picture) said in a four-paragraph statement today. He appeared to accuse Bank Islam of using the police reports to intimidate and harass him. “This heavy-handedness is nothing but an intimidation and harassment tactic against me,” he said, adding that he is currently seeking legal advice and will instruct his lawyers to take further action if necessary. Azrul told The Malaysian Insider today that he was not aware of the second police report. “In the course of our investigation into these breaches, the Bank discovered evidence of other violations which warranted us to make a police report on 18 January 2013. “Upon further investigations, the Bank lodged a second police report today,” the bank added. It reiterated that Azrul’s suspension had nothing to do with his presentation at a regional economic conference in Singapore early this month, where he predicted that the ruling Barisan Nasional (BN) could lose this year’s general election to Pakatan Rakyat (PR). Bank Islam Malaysia’s main shareholder is the Lembaga Tabung Haji, which is a government-linked fund in charge of Muslims performing the Haj. The bank lodged a police complaint against the economist last Friday, accusing him of violating its internal policies and code of ethics which it said amounted to criminal offences. A copy of the police report was scanned and put online. In the police report, the bank’s head of human resources Jamilah Abdul Sallam, said Azrul had been found to be in possession of the minutes of the bank’s board of directors’ meeting deemed to be confidential and sensitive as it involved a corporate exercise proposal involving Bank Islam. “Mr Azrul who had no access and authority to the documents had handed those documents to an unrelated third party without approval. “The documents were scanned and sent by email to a third party on 21 June 2012 at 12.36pm. The email was titled TOP SECRET,” Jamilah said in her police report, which has been posted on several blogs <http://thebenchmark0.blogspot.com/2013/01/bank-islams-police-report-against-wawa.html&gt;. Dang Wangi district police chief, ACP Zainuddin Ahmad, confirmed Bank Islam had lodged the second police report earlier today, but declined to disclose further information. 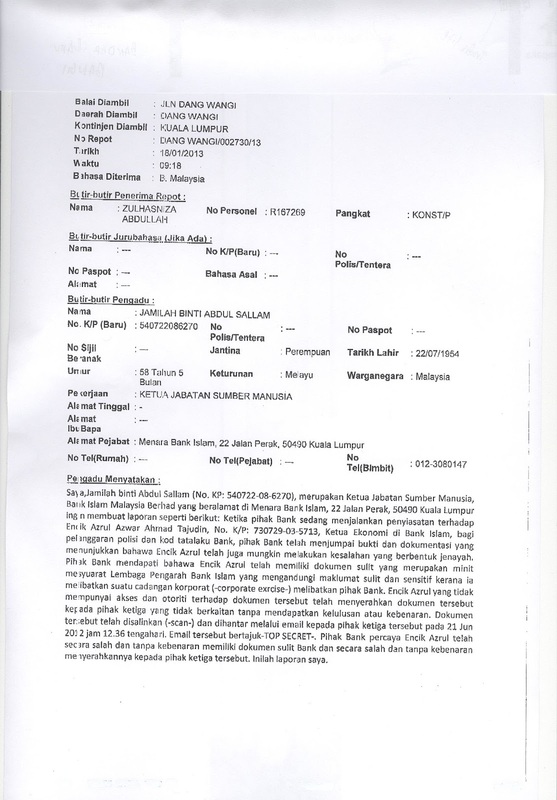 “Ya, we received a police report from Bank Islam on Azrul Azwar. It was made this morning. “I cannot disclose any further information on the case, but we will investigate with the evidence and testimony given,” he told The Malaysian Insider when contacted over the phone. Azrul was suspended from his duties by the bank on January 14 after he was reported by Singapore’s The Straits Times to have predicted a narrow win in Election 2013 by Pakatan Rakyat (PR) as the most likely out of three possible scenarios. In a report by The Straits Times, Azrul Azwar’s calculations found that one of the most likely scenarios was that the ruling Barisan Nasional (BN) coalition would likely win only between 97 and 107 of the 222 parliamentary seats, which are insufficient to form the next administration. But the result would also mean that PR will only gain a shaky hold over Parliament, far from the supermajority once enjoyed by its rival. The two other likely scenarios reportedly presented by Azrul Azwar was that there would be a narrow win for BN and a bigger win for PR. Azrul Azwar had taken into account factors such as race and demographics. He had also forecasted that under the most likely scenario of a narrow win by PR, a fallout would result, with the stock market set to respond in a “knee-jerk” fashion as well as an extended period of perceived instability. He also did not rule out the possibility of “economic sabotage” by businesses and the civil service that are aligned with BN. The Police report made clearly stated “The bank found evidence and documents to show that Azrul Azwar likely to commit a criminal act” and ask for an investigation. Leaking so many highly confidential and sensitive information and scanned documents of the bank via e mails which include Board of Directors (BOD) and Exco papers to third party where he had no authority and access is ‘information theft’. It is a criminal breach of trust. Especially part of the documents leaked are BOD papers for the bank’s corporate exercises. It is baffling that persons of such attitude and psychological state is being employed by banks. For an employee who has been appearing actively in certain political party’s dos which are clearly practicing ‘Politics of Hatred’ and the bank failed to monitor his activities is rather alarming. Leaders of PKR are known to lie and manipulate facts in the objective to confuse the public in the ‘Politics of Hatred’ strategy. Clear examples are ‘Rosmah Mansor is behind the murder of Altantuya’, ‘Rosmah Mansor’s RM24 million ring’ and ‘The Scorpene Submarine Trial in France’. In the case of “National Feedlot Corporation’, PKR Director of Strategy Rafizi Ramli is being charged under Section 97 of BAFIA act for making public account details without consent. It is clear that Azrul Azwar e mailed all these confidential and sensitive information and documents to PKR party leaders, to be used by them for another political intent of malice and perpetuating lies for the ‘Politics of Hatred’ strategy. Azrul Awar should just focus to facilitate the investigation, which should be made by the Police’s Commercial Crime Department. PKR should be more concerned about employees of banks and financial institutions contravening specific laws such as BAFIA and eroding public confidence in the secrecy within the banking system. This would eventually affect any FDIs and Prime Minister Dato’ Seri Mohd. Najib Tun Razak in making Malaysia a financial hub. This is the real ‘Economic Sabotage’.